The E.E. should be in 12-point, preferably Arial or Times New Roman. And it should be double spaced, with numbered pages. 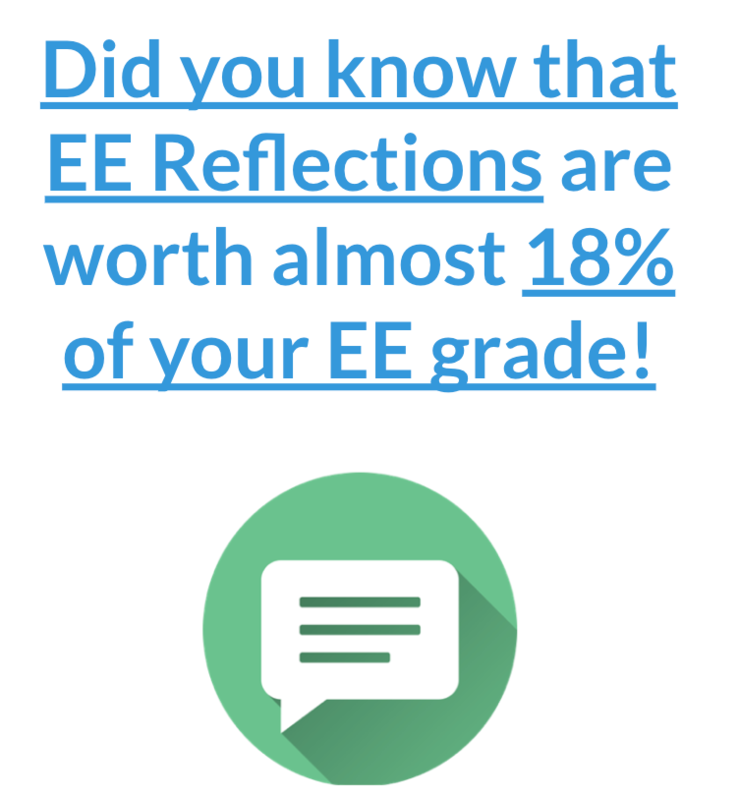 About 18% of your EE marks now come from your reflections, so those are also important. Here’s how to do them: How to Write IB EE Reflections (IBM) so be careful with those too. All parts of your EE, with page numbers of course. (You can just copy and past my list to get you started). Tell us what organization(s) you’re researching and what these companies do. Tell us what you’ll be exploring and how (very briefly). Provide some context for your question. Tell us the situation that the question comes from. Tell us your research question again and explain to us why it is important to answer. Explain why this research is interesting and valuable to your audience. I recommend your methodology have two major sections. One for explaining your sources and one for explaining your tools. You’ll notice that, as much as you’re telling us what you are going to use to answer the question (sources and tools), you’re also pointing out the limitations and weaknesses of these. Describe each of your major sources of primary and secondary research. Tell us why they will be helpful and also a weakness or a limitation for each source. For example, how there may have been room for bias or a limited scope to your research. Or perhaps there are other reasons why other data you used could be unreliable or invalid. Remember that the majority of your research for the EE should come from secondary sources. Mention any adjustments you made to your research as you progressed with your EE. There should be at least one. Explain the tools you’re going to use (very briefly) and why (the purpose of each tool). Also tell us about some weaknesses or limitations of each of the tools you are going to use. This shows us that you know a lot about these tools. If you need more help with this, there is a lot more advice and guidance in my Business EE program. Mention any changes made to your tools as you progressed with your EE. There should be at least one. This is where you’ll be sharing your research, analysis, discussion and evaluation. Think of this section as also having two main parts. The first is for your tools. This is where you show off that you understand how to do the stuff you’ve been taught in Business Management class. The second is for the rest of your research. Most students will only do the “tools” section, but this second part is where you get to wow us with all of the impressive extra research that you’ve done, which goes beyond what is taught in the course. Every single paragraph of the body needs to relate (in a very obvious way) to the research question. Don’t include tools or research which don’t help you answer your question. I recommend you include least one financial tool, if you can. Put your qualitative tools (such as SWOT and PEST) before the quantitative ones (like ratio analysis and decision trees). Qualitative tools help set the scene and provide context for the financials. This is where you really get to impress us. Often this is the part where you’ll actually teach the reader of your paper (and experienced Business teacher) a thing or two. Review several related theories and concepts, more extensively than the course does. Impress us. Give us the sense that you really do know how this industry works. Show that you’re the expert in several aspects of your question, or that you’ve at least asked experts. Research about some famous mergers in the pharmaceutical industry. Were these considered successful and why? (This could help you explore whether your merger has had similar outcomes. Make sure this section is analytical, rather than descriptive. Be very careful to make sure that all of your theories in this section are really helping you answer your RQ. A graph of some kind is recommended. But of course link your graph to the RQ. Sometimes you might learn that there is an analytical method which is commonly used in your industry (i.e. a ratio that isn’t taught in the course, or a way of measuring customer satisfaction). Feel free to include that in your EE here. If you can’t think of what else to include, look for interesting links to one of the concepts: change, culture, ethics, globalization, strategy and innovation which might help to answer your question. Take time with your conclusion, so you can really emphasize everything you've discovered and how it all fits together to answer your RQ. Pull your mini-conclusions together (synthesize them), make some interesting insights based on them. This is where you really get to shine. Don’t include any new data in your conclusion. Mention some weaknesses and limitations of your research. There needs to be at least two. Show you have really reflected on your work. You could discuss possible inaccuracies in your work and the reasons for those. This is similar to how you write your EE reflections (IBM). Discuss other information would it be very valuable to have, but which you couldn't access. Or could you could explain some other “unresolved questions”, which you weren’t able to answer for whatever reason (i.e. access to data). Explain at least one thing that you would have done differently if you were to do it again. (Don’t include a recommendations section in your EE, like you do in the HL Business IA). This is where you reaffirm (remind the marker) all the great sources you used. Remember that your EE is mostly focused on your secondary sources. Include at least 3 books (one of these can be the textbook), 4 internet sources, and at least 3 sources which show your willingness to work hard and go beyond the minimum requirements (i.e. a trade journal, an advanced academic paper (IBM link), an interview with a competitor). Generally you should have at least one primary source (i.e. an interview, a survey, observation data, focus group data), but it is not mandatory to have a primary source. Make sure all of your bibliography sources are link to in-text references in your EE. The jury is out about appendices. The EE guide us us that “appendices are not an essential part of the extended essay and examiners will not read them, or use any information contained within them, in the assessment of the essay” (EE guide, Page 87). That seems pretty clear. And yet, they are still commonly used. I would say the best use of appendices is to include artefacts from your process, which help to show the hard work that you’ve done. Additional analysis you did which didn’t fit in the body of your EE. Questionnaire results, details of the calculations you did for your financial tools. IBMastery also has an EE Mastery course you can get here (included with the Business Mastery Pack), which has a lot more helpful resources (videos, etc) to help you do your best.